Or so it seems when it comes to charting the musical advancement of artists sometimes. While sudden jumps in creativity, and in commercial success for that matter, of an artist you’ve been keeping a close eye on always carry with it the hope that it’s a new plateau that is being reached which will remain the standard they’ll continually meet thereafter, too often it’s merely a momentary peak that stands out among the usual bill of fare. Disappointment at a return to average, or worse yet, a drop to below average, is cause for concern, even eliciting the fear that you might’ve overrated what you’d just raved about. But both the highs and the lows have a tendency to be out-sized at first glance when trying to get a sense of the emerging big picture view of an artist. Few people are ever as good as their best moments and few are ever as bad as their worst records. That’s a good thing to keep in mind, especially when the artist in question is still just a minor and therefore under normal circumstances would be failing to live up to more “normal” standards of a 17 year old set by parents, teachers and first time romances rather than being judged on the artistic merits of the B-side of his first monster hit record. Since the cat is quite glaringly out of the proverbial bag already it probably is best not to jump right to the critique of the record itself without first trying to cut the kid some slack. Or at least put things into perspective. Little Willie Littlefield was indeed just seventeen years old and while not an amateur by any means (he’s released a handful of records to date and has been playing professionally in clubs since he was 14) it’s probably safe to say that he’s been riding his natural talent to this point more than using the rigid disciplines learned over years of hard work. Even his best sides prior to this release had some crudity in their formula. Rip-snorting piano boogies were a dime a dozen in the places he played and though his skills at performing them were certainly admirable, their appeal lay largely in their rambunctious enthusiasm and barely controlled anarchy. That and the fact that rock was still seeing a comparative shortage of such gaudy displays on the keys, especially compared to say the saxophone which is where the bulk of the instrumental excitement had been found, surely helped to stand Littlefield apart at first glance. But luckily Littlefield was hardly confined to just banging on the ivories to make his living, he’d also proven to be a seductive singer with a tone more than a little reminiscent of Amos Milburn who was the biggest star in the rock field at this point. Furthermore Willie’s compositions in that realm had been solid and with the top side of this one, It’s Midnight, downright exceptional, so he was shaping up to be a very versatile artist who could conceivably score in a number of different ways. All of which means it’s understandable, smart even in an economical sort of way, for Modern Records, his new home, to not waste his best shots on two sides of the same record. Getting him established in the commercial realm was most important at this point and they wanted to put his best foot forward on the A-side, a vocal performance to set his persona going forward. As we have said here numerous times the B-sides were intended for something different in the best case scenarios, which means in Willie’s case an instrumental to show his prowess on the keyboards. So the concept of what they were doing here was faultless. The problem was Midnight Whistle was probably his weakest such performance to date. I suppose there was a limit as to how many generic piano boogies someone could reasonably come up with before they began to sound repetitive and so a change in approach couldn’t do anybody any harm. But since his previous instrumentals had come out on the just conceived Eddie’s Records in the fall of 1948 and similarly brand new Freedom Records in late winter 1949 it’s doubtful the same people buying Modern Records on a national scale, as opposed to the more regional releases that preceded it on the other labels, would even be aware he’d covered such ground already had they issued another storming boogie. It also might’ve helped that such a song would offer a much different feel than the languid vocal on the A-side, something which would’ve given listeners a jolt after hearing him sing in a rather melancholy manner. But those are probably post-release quibbles that would’ve gone unstated had Midnight Whistle just lived up to its obvious goals because while it’s true this is roughly the same tempo and mood found on the other side of the record, it’s also an attempt at doing something genuinely creative. The way the record starts off has shades of Lloyd Price’s 1952 hit Lawdy Miss Clawdy, which featured Fats Domino on piano. We just got done saying yesterday how Fats was influenced by Littlefield, and this perhaps is further evidence as to just how deep that influence ran. But whereas Price (and Dave Bartholomew producing) had come up with an arrangement that took off from that initial starting point, here the ensuing song peters out rather quickly, descending into a mismatched amalgam of sounds – a horn section featuring a far too prominent trumpet wrestling awkwardly with his piano and as a result nothing about this ever gels. There’s no appealing melody to latch onto here, something which is further exacerbated by the slow pace of the horns clashing with the more spry keyboard work. Technically speaking it fits together, at least there’s nothing clashing outright, but the pieces don’t compliment one another. There’s no sense of building towards anything, no moments where the one component helps to lift the other and make their combined efforts work better than their individual parts. It’s a decent idea done in by a lack of editorial oversight. This was a case where someone had to stop the take and say, “Guys, I’m just not feeling it here, let’s go back and work this out a little differently”. Of course saying that here, in 2018, doesn’t take into account the realities of cutting this in June 1949. Context, we keep preaching, and so while the record itself is mostly inconsequential, something that won’t help Littlefield’s career but certainly won’t hurt it either, the more edifying aspect of this non-descript B-side is found by taking a look at the system that produced it. 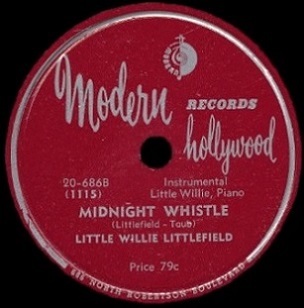 Modern Records signed Little Willie Littlefield in the spring of 1949 when Jules Bihari, one of three brothers who had started the label (along with Joe and Saul) was in Houston scouting talent. 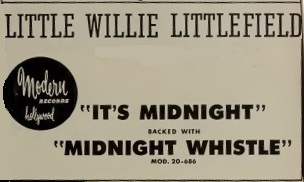 Though Littlefield had recorded for Eddie’s Records since the previous fall, that company had gone under and sold his one remaining side to Freedom Records, another local start-up label, and so Willie was free to sign with anyone. Jules saw him performing at the Eldorado Ballroom and was duly impressed, particularly regarding his similarities to Amos Milburn, currently rock’s biggest star who was also a Houston native that Modern had regrettably turned down early on and were still kicking themselves over. Looking to make amends now with another kid with great potential Modern’s pitch to Littlefield included the chance to move to California to further his career, which certainly at the time was seen as something of an exotic promised land of opportunity, especially for blacks growing up in the more oppressively racist southern climate. Willie had to get his mother’s permission since he was still underage, but once he did he was taken into a local studio to cut demos. THIS is the part that jumps out at you because they brought him in twice, once in April, then again in May, just Willie at the piano going through his repertoire. He cut an astounding fourteen songs, many of which were the rough blueprints to his later records. This kind of thing however was definitely unusual for the time. You might want to get SOME sense of how he comes across on tape, but they already knew that because he’d had actual records released. That leads to the possibility they were looking to rip him off, which of course they did, as they attached the Taub name to all of his songwriting credits which gave them half of that income in perpetuity (Modern was, by far, the worst in this regard of all of the independent labels). A lesser company might’ve even just issued those demos as finished products without paying him at all for his work, but thankfully they stopped short of that level of brazen theft. So the question becomes with all of this prep-work being done, why was Midnight Whistle – one song that had not been worked out in those two practice sessions – the song chosen for the flip side of his first release? That they had just one other completed take from the proper June session with full band might’ve made their decision for them, as they didn’t want to use the remaining side (Drinking Hadacol) as a flip when it might make a good A-side down the road (which it was), but as a result Midnight Whistle can’t help but be something of a let down because it’s so clearly a step backwards from not just the top side of this record, but of everything else he’d done to date. The one remaining mysterious factor in it, something to make listening nowadays worth your effort, is trying to decipher the intriguing possibilities of a seemingly ad-libbed shout out by Littlefield during the instrumental break, about 2:20 in where he says, somewhat off-mic but clearly audible, “Maxwell”… either calling out for him to play or joking with the band about them playing LIKE Maxwell Davis, who by all accounts was NOT in Houston, NOT on this record and had not even met Little Willie Littlefield by this time. The next session, in early July, Davis would be involved, as he was not exclusively bound to Aladdin Records but was free to cut sessions for anybody and as the top Los Angeles sax player and rock producer he was obviously in high demand. But was that demand for the mere suggestion of his presence that Joe Bihari, who ran this session in Houston, actually encouraged Littlefield to use his name, a la Amos Milburn who frequently cried out for Maxwell to blow during the breaks on his record? If so it’d be perhaps the first documented case of subterfuge in rock ‘n’ roll, a fairly harmless, though underhanded if slightly ingenious, ploy to get listeners to think they were listening to Milburn after all. That’s hardly the best way to promote your own new act, but this wasn’t an ethical business to start with, so who knows. In the murky independent record label world of 1949 the mere fact that such a thing was possible shows how much everyone involved felt they had to do anything and everything under the sun to eek out an existence. But of course Modern Records DID have something on board to ensure their survival, as Littlefield became their first budding rock star to go with their impressive blues roster and it would be his presence on not just the label but on the overall rock scene in general which would help the entire traveling musical circus go ever higher in the years to come. That it wasn’t very evident on just one side of his first record for the company is nothing to hold against him. Leave a reply on "Little Willie Littlefield: “Midnight Whistle”"